As dusk settles in around the City of Toronto, Ontario in Canada, the skyline takes on a new appearance as the lights become illuminated showing their reflections across the surface of the lake. 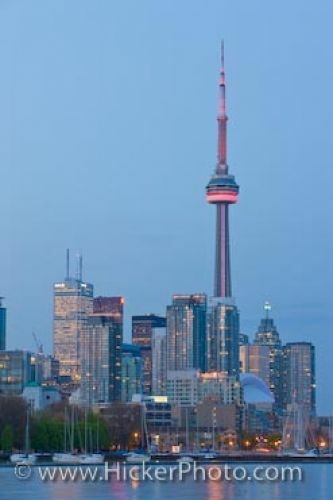 The CN Tower, a famous tourist attraction, is the tallest of the buildings across the skyline with the skyscrapers appearing almost miniscule against it. The shops and lanterns along the street emit their yellow glow as luxury yachts moor at the marina along the waterfront. Across the harbour, a waterfront park named Little Norway is a beautiful place to watch the skyline of the downtown core of Toronto City change at dusk. Picture of the skyline of Toronto City in Ontario, Canada at dusk from Little Norway Park.